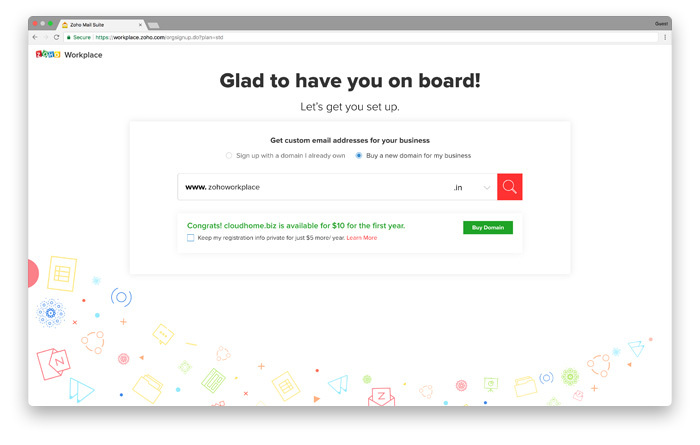 Go to https://www.zoho.com/workplace/pricing.html and click on 'Get Started' button under free plan. 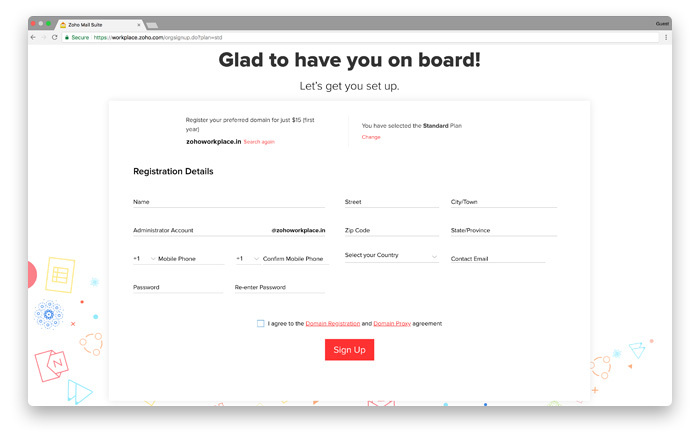 In the next screen put your website name as "Sign up with a domain I already own"
Fill in all the necessary details and click "Sign Up"
Select your domain's DNS Manager from the drop down box which gives a list of popular DNS Hosts. 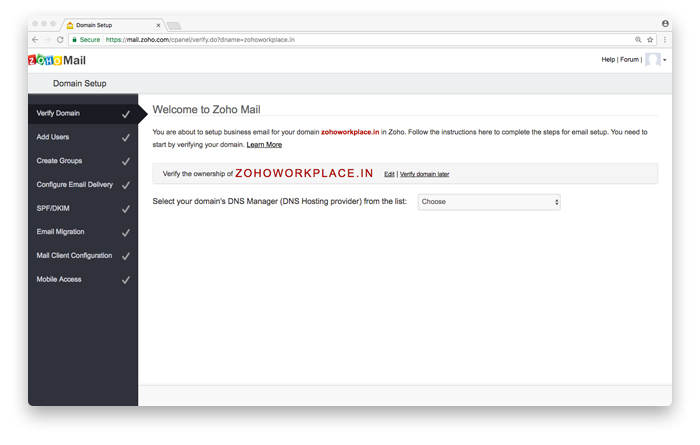 For example, if your DNS is hosted by "GoDaddy" , Zoho will provide instructions accordingly. 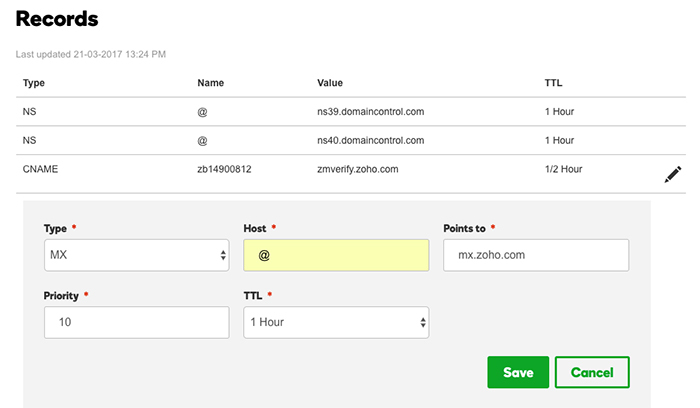 Copy the "zb******** code" (unique for each domain) generated in your Zoho account and paste it in the "Host" field. 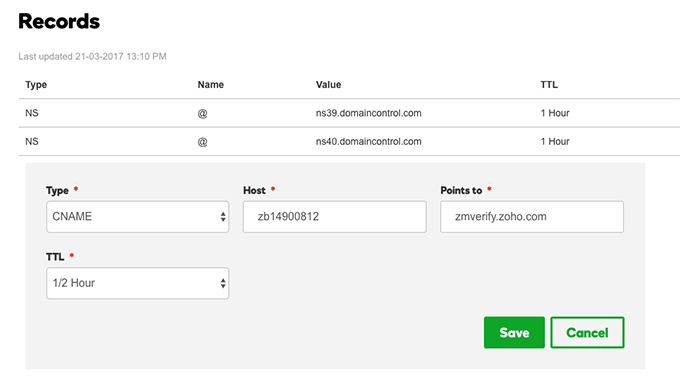 Enter "zmverify.zoho.com" under the "Points To" field in your DNS Records, and click the "Save" button. Once you've saved the record, the CNAME will be added successfully. 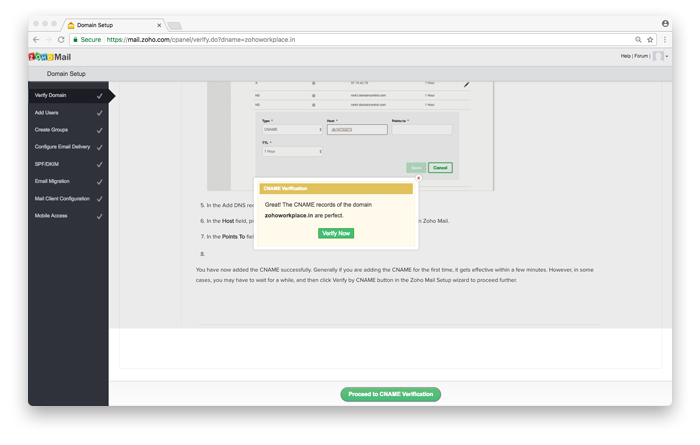 Click on "Proceed to CNAME Verification" and click "Verify Now". Now, you can create your respective business e-mail id(s) with your domain by clicking on "Create Account". 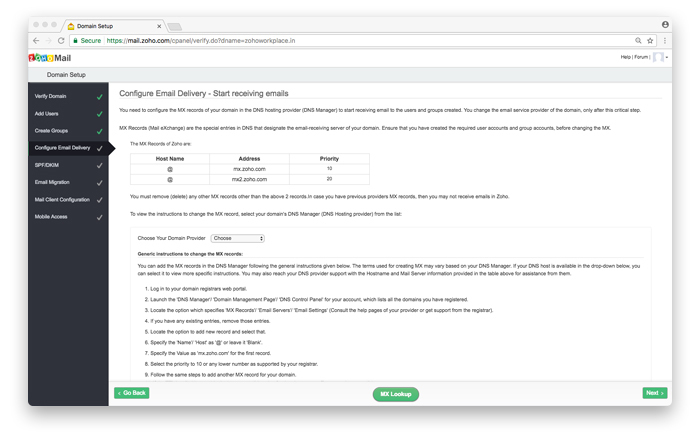 Configuring Email Delivery can be done by adding your MX Records.You will be able to receive emails in your Zoho mailbox only after you add the MX Records. Login to your GoDaddy DNS Manager >> My Accounts >> Domains >> Manage DNS.In the DNS records information page, click the "Add" button. 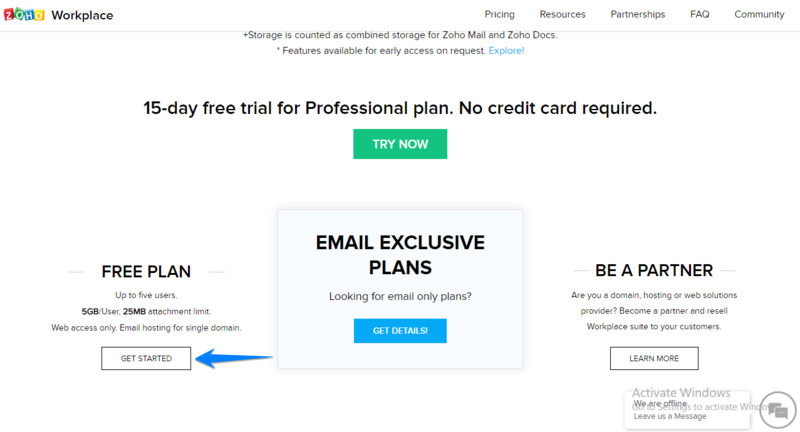 Select the type as "MX" from the "Type" drop down menu.In the "Host" field, enter "@", in the "Points To" field, enter "mx.zoho.com", and in the "Priority" field, enter "10", and click "Save".Similarly, add another MX Record by hosting it to "@", pointing it to "mx2.zoho.com", set the priority to "20" and click "Save".Add a third record and host it to "@", pointing it to "mx3.zoho.com", set the priority to "50" and click "Save".Ensure that you have deleted all the MX records related to your previous email provider, as it will conflict with Zoho Mail and affect email delivery. 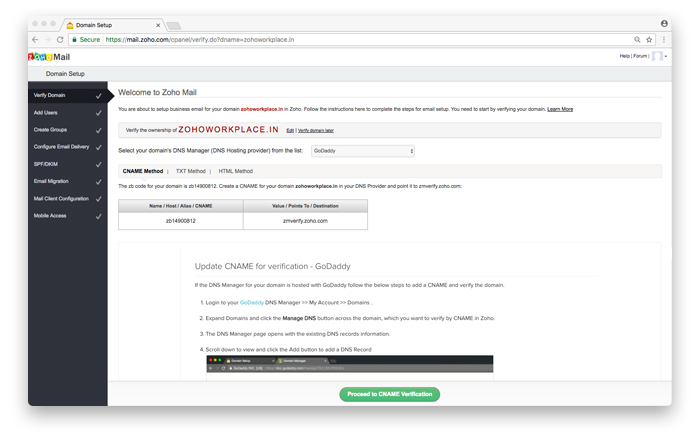 Login to your GoDaddy DNS Manager >> My Accounts >> Domains >> Manage DNS. In the Records section, click the "Add" button. 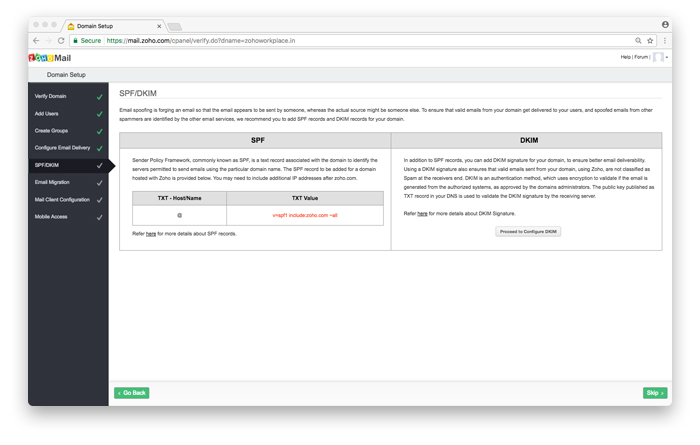 In the Type drop down, select "TXT", specify "@" in the Host field and in the TXT value field, enter, "v=spf1 include:zoho.com ~all", and click "Finish". After this step, your account set up is officially done. 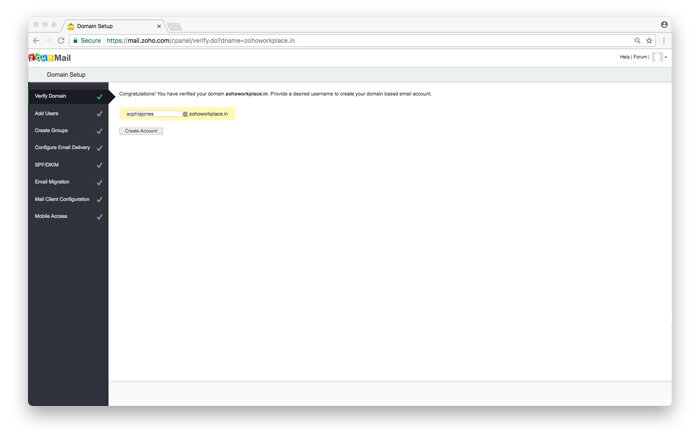 You can send test email to the email ID to check if it is working fine.